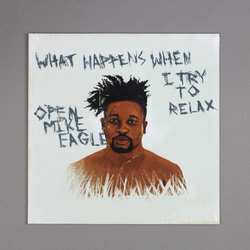 Open Mike Eagle - What Happens When I Try To Relax. Vinyl LP. Bleep. After a few years of kicking it with the Mello Music Group, Swim Team/Thirsty Fish member Open Mike Eagle chooses to go it alone for his new EP. What Happens When I Try To Relax is out via Mike’s own Auto Reverse Records, a move in keeping with the fierce DIY spirit that the rapper/producer has demonstrated throughout his career. Musically it’s a typically impressive showing from Mike. Many of the beats here are pretty unique blends of cloud rap, trap and various indie styles - check the likes of ‘Relatable (Peak OME)’ and ‘Every Single Thing’. Elsewhere on the record we journey towards snap (‘Southside Eagle (93 Bulls)’) and the psychedelic boom-bap of Section.80-era Kendrick Lamar (‘Single Ghosts’). Whatever the instrumental, Mike can always be relied on to come through with dense wordplay and profoundly intelligent bars.